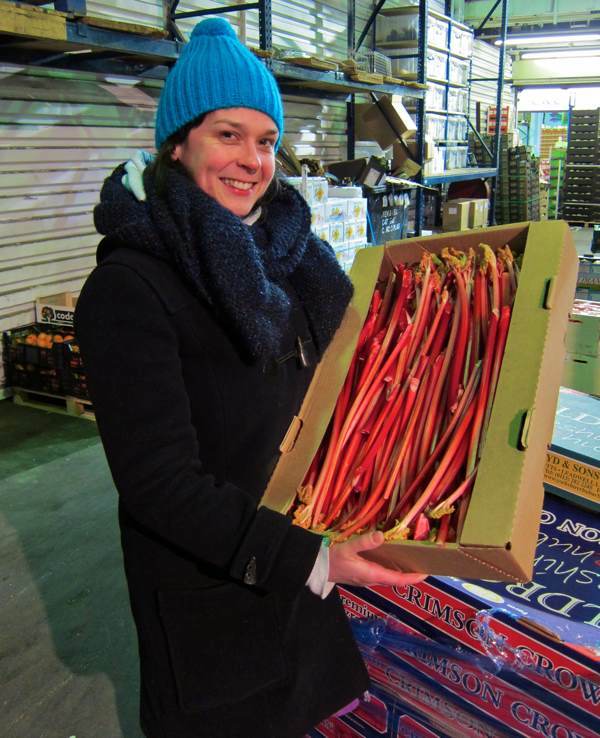 Lillie O’Brien & I were at Covent Garden Market before dawn yesterday to get the pick of the crop of forced rhubarb. It is the only English fruit that is in season now and we bought it straight off the truck that had driven down overnight from the famous Yorkshire Triangle, where a frost pocket sweetens the rhubarb naturally and, after four generations, the Oldroyd family still grow rhubarb by candlelight in the time-honoured method. Once upon a time there was a Rhubarb Express to deliver trainloads of rhubarb to the hordes of eager Londoners craving rhubarb, but yesterday there was just Lillie & me seeking rhubarb while the city slept. 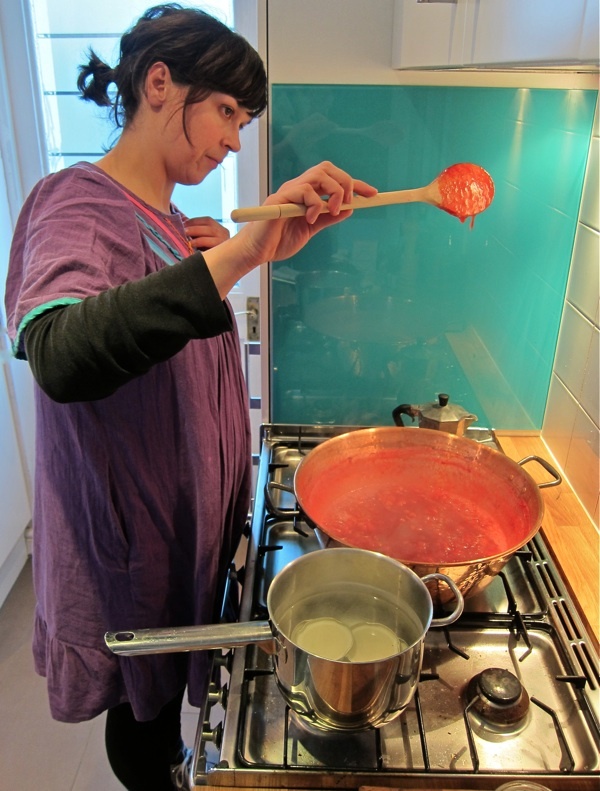 After four years as pastry chef at St John Bread & Wine in Commercial St, Lillie O’Brien struck out on her own last year to create the London Borough of Jam, a one-woman operation making small batches of the highest quality preserves from the freshest seasonal ingredients. 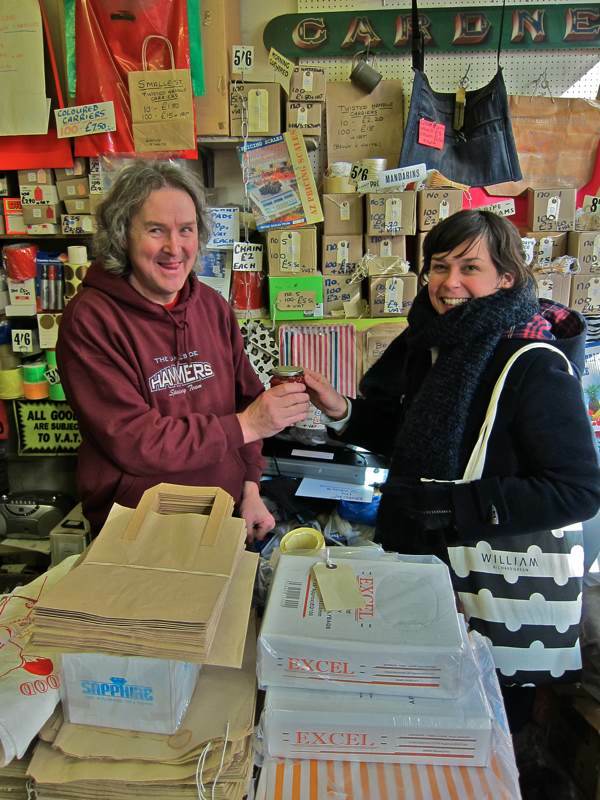 Seeking a name for her endeavour in the Hackney Local History Library, the label in the book identifying it as the property of the London Borough of Hackney caught Lillie’s eye and the witty identity for her new project was born. Through the autumn, Lillie filled the cellar of her house with jars of delicious jams made of the fruits of the harvest, only to have her entire stock bought out at shops and markets by greedy East Enders hungry for jam last Christmas, creating an imperative to feed the demand. Towards this end, our mission yesterday was to buy the best rhubarb, drive back to Lillie’s tiny kitchen in Clapton and make it into jam ready for sale this weekend. 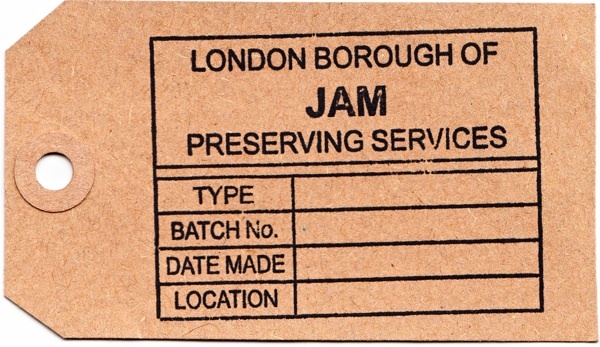 At five thirty, we were driving down to Covent Garden and by ten thirty we had jam, it was a highly satisfactory achievement for so early on a February morning. At the market, we were greeted by Paul & Terry of Lenards wholesalers. By then, the night’s trading was already over but it was the ideal opportunity for a rhubarb hunt and Paul & Terry were the expert guides to lead us to the best options available. As we walked through the aisles, every fruit you might desire was on display, freighted in from each corner of the globe, yet in spite of the pristine appearance, the raspberries were bitter, the strawberries were watery and the cherries were brown at the centre. A discovery that confirmed our resolution to buy the fruit that was in season. The one diversion from our rhubarb quest was for blood oranges from Sicily, and as I stood in the sub-zero temperature of the market, I was transported to Southern climes by the intense sweetness of the ruby-red flesh of this gleaming golden fruit. Lily took a box to make some marmalade. We found fat rhubarb and thin rhubarb, long rhubarb and short rhubarb. Some that was past its best and some that looked rather pale. 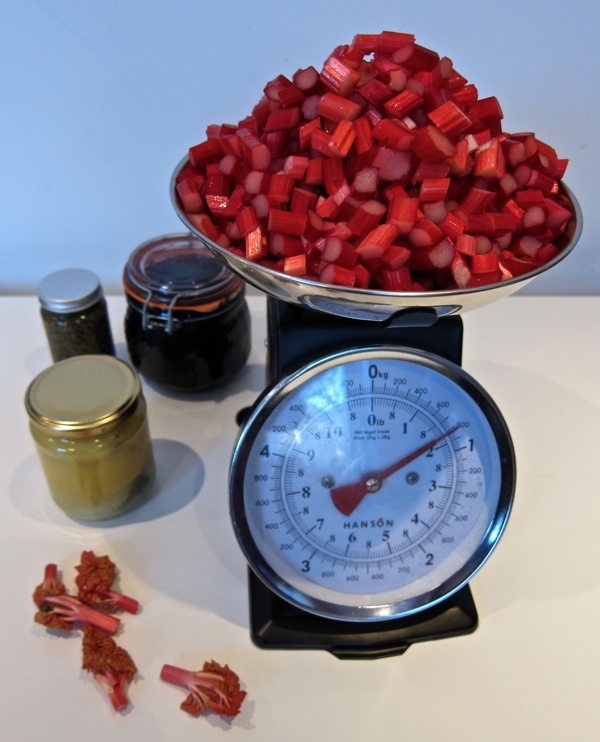 Apparently, chefs like fat rhubarb to create chunks in their crumble, but Lillie prefers a smooth texture to her jam and when she opened a box of skinny rhubarb – blushing almost coral in its redness – her eyes widened in excitement and I knew we were in business. In a state of raging anticipation, we carried our crates of gleaming rhubarb into Lillie’s tiny kitchen and Lillie shrieked with excitement at the ice-cold water as she washed the stalks in the sink. We paused briefly to admire the aesthetics of the curly dappled flowers before we beheaded them mercilessly and Lillie chopped one kilo of rhubarb into small pieces, while Chester her cheeky British Blue cat rubbed at her ankles. 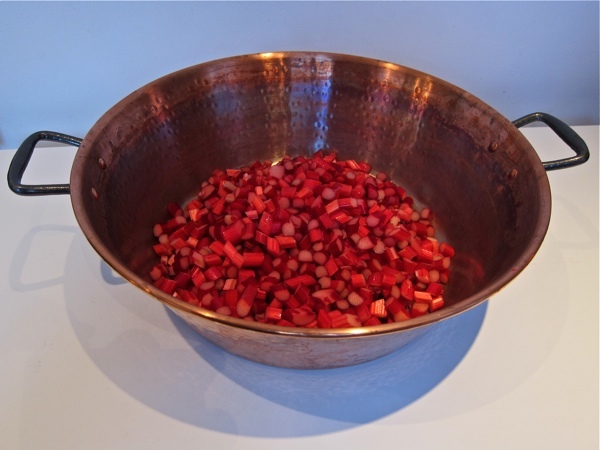 Lillie talked as she worked, weighing up the rhubarb and then transferring it to her beautiful copper jam pan. Copper is the best conductor of heat which means that the fruit will cook evenly, avoiding any overcooking that might compromise the flavour. This is why Lillie cooks her jam in small batches because larger amounts take longer to cook and the fruit does not cook consistently. Adding jam sugar and then the juice of a lemon, Lillie kept stirring as the liquid evaporated and the rhubarb reduced to an even texture. Meanwhile, she heated the jam jars and boiled the lids, both to sterilise them and to ensure that her hot jam had a hot jars to go into into, so there was no risk of the glass breaking. Lillie constantly checked the consistency of the jam, its viscosity revealed by how it dripped from the spoon. Then she added the finely chopped stem ginger and the jam was almost ready. “I’m so happy, I’m beside myself with the colour! This is going to be the most beautiful rhubarb jam I ever made.” she declared in unmitigated delight, as she poured it from the pan through her jam funnel, making just four jars. This painstaking technique required Lillie to spend the rest of the day working through her twelve kilogrammes of rhubarb, yet ensured the unmediated fruitiness that characterises her jam. An essential trip to Gardners Market Sundriesmen was required to purchase more labels for this new batch of jam before Paul Gardner left for the weekend, which meant that Paul was the lucky recipient of the first pot of jam. 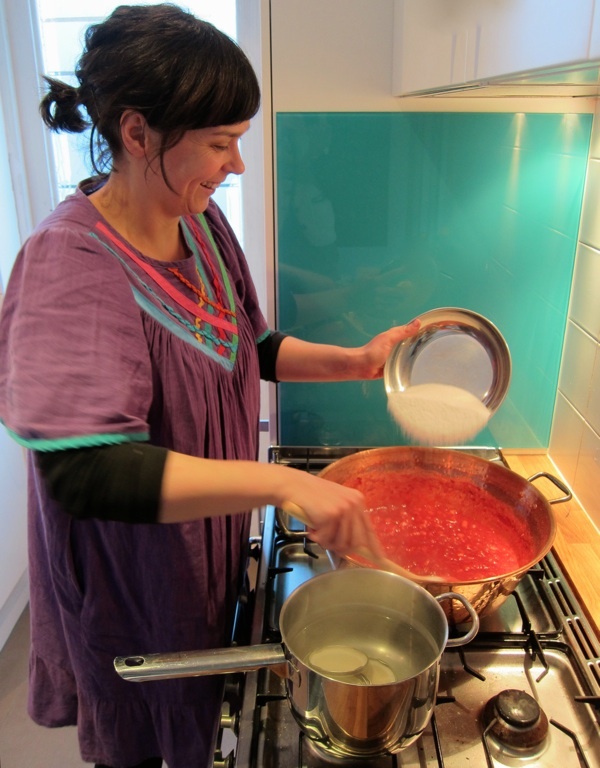 Then Lillie returned to her kitchen for a long day’s jam-making before writing the labels that evening, and all so the rhubarb & ginger jam can be on sale this weekend. 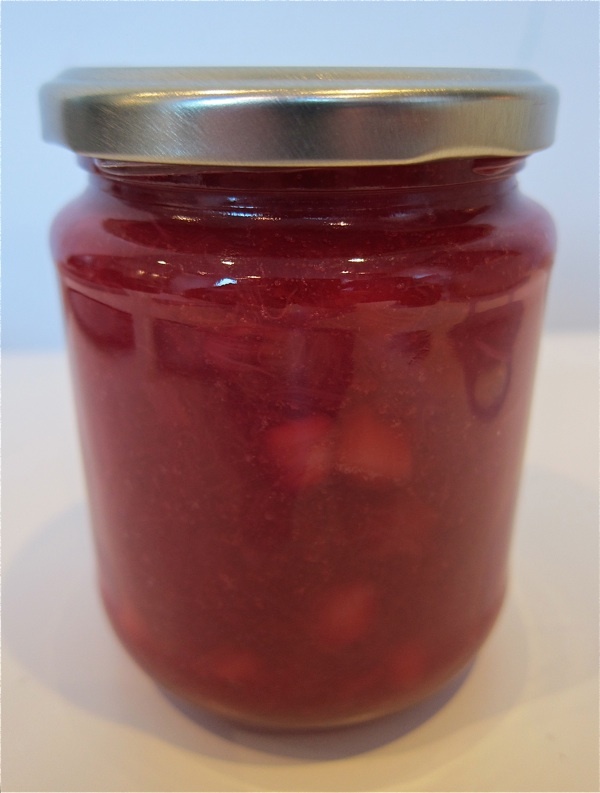 A lush deep pink jam with a vivid flavour that is more rhubarb than even rhubarb, a perfectly spreadable texture and a subtle piquancy of ginger – this is what I shall be having on my toast at breakfast this morning, thanks to the London Borough of Jam. The rhubarb in Lillie’s new jam pan. Rhubarb & Ginger Jam by the London Borough of Jam. Paul Gardner of Gardners Market Sundriesmen gets the first pot of rhubarb & ginger jam. You can buy jams and preserves by London Borough of Jam at Leila’s Shop, E5 Bakery and from Lillie’s fortnightly stall in Chatsworth Rd Market on alternate Sundays. 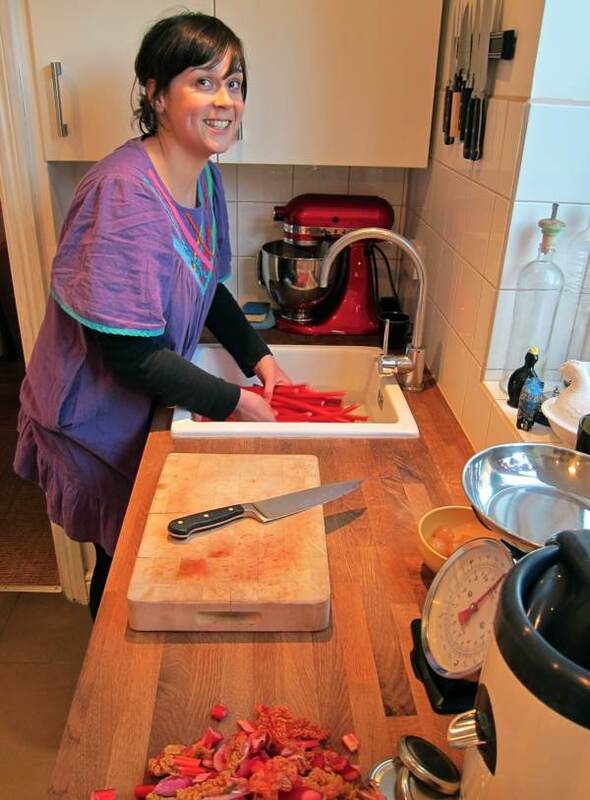 She will be there this Sunday with pots of her rhubarb & ginger jam. Buying the Vegetables for Leila’s Shop. I love making jam too (Like Lillie, I think it’s only worth doing with fruits in season). So normally, I wouldn’t be a candidate for her jam, wonderful as it sounds. But rhubarb is almost unobtainable here in the foothills of the Pyrenees, and her pink creation, with its ginger highlights sounds a ‘must-have’. I’m going to see if I can find some when I’m next passing through London. If she has any left…..
my mouth is watering. the pot is gorgeous, the knives and stove enviable, the jaunt before dawn to covent garden for — oh the whole thing is marvelous. thank you for a wonderful trip. here is her sister jammer jamming in berkeley, CA. These jams are delicious. I have tried the Rhubarba and Rose Geranium and it is a sensation. How too funny–I thought of June Taylor immediately when I saw this post and sent her the link! What a lovely post. I love the name of Lillie’s business and her dedication to making jam in such small quantities is impressive, and a huge time committment. Her jam looks delicious. I love making jam, having got into it only in the last few years, so enjoyable. When I read this entry, I went into my kitchen and opened a jar of June Taylor’s Seville Orange in Syrup to eat on wheatmeal biscuits. Delicious! And I am so glad I had something wonderful to eat after reading about Lillie’s jam. Just delightful!! Got my taste buds going….. How I miss London!